QB Mike Reilly, RB Carey Davis, RB Isaac Redman, RB Justin Vincent, WR Dallas Baker, WR Tyler Grisham, WR Brandon Williams, TE Dezmond Sherrod, OL Jason Capizzi, OL Jeremy Parquet, OL A.Q. Shipley, DL Sonny Harris, DL Steve McClendon, DL Scott Paxson, LB Bruce Davis, LB Tom Korte, LB Andy Schantz, LB Donovan Woods, DB Roy Lewis, DB Anthony Madison, and kicker Piotr Czech. Also, the team placed TE Sean McHugh on IR, shelving him for the year. There weren't many surprises outside of Redman, and to a lesser degree, special-teams ace Madison and former starting FB Carey Davis. I also thought Woods was ticketed one of the final spots on the 53-man, but that turned out to be wrong as well. The Bruce Davis Era will quietly go down as one of the more disappointing in Steeler draft history, given his status as a third-round pick in 2008. Sadly, his release was not even a surprise. But all in all, this was a cutdown mostly void of shocking names. What bubble-sitters made it? Internet phenom Frank the Tank Summers proved that contrary to what Edmund Nelson says, you can make the club from the tub. WR Shaun McDonald brings some veteran depth to his position, and LB Arnold Harrison has battled his way back from yet another injury to make the team. DB Ryan Mundy of Woodland Hills fame will help fulfill the quota of local players sacked by the exits of Shipley and Capizzi. 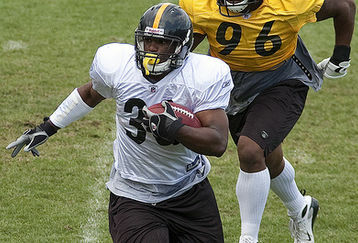 LB Patrick Bailey will be back to build upon his 2008 Steeler Rookie of the Year campaign, and DB Keiwan Ratliff will try to prove that he was a good offseason acquisition. Keep in mind that the roster may change in the very near future as players from around the league become available to the Steelers and everyone else. According to Jim Wexell, all released Steelers with the exception of Carey Davis, Madison, Paxson, Parquet, and Williams will be eligible for the eight-man practice squad if they clear waivers. So stay tuned for some pending follow-up moves from the Steelers as well as the rest of the NFL.